The writer of the original invitation was a Mr H Bingley. Most of these memories suggest that the first meetings of the Society were held at The Grange, Kenton but records exist which prove the first meetings were held at Mr Bingley’s house. Then, from March 1936, they were held at the Club’s first HQ which was established in the Boy’s School, Sheepcote Road Harrow. During the time of the links with the Society 1936-39 the headmaster was Mr L J Thompson. This independent school closed in 1986 when the land was sold for building new flats. An early reference was made to “room for about 120ft of locomotive track” suggests that there was an intention to provide facilities for running model locomotives. In the first years this was accomplished by laying a temporary track on the lawn of the Boy’s School. This portable track probably belonged to a founding member Arthur Pole. He was keen on running his model 5″g Tilbury Tank at local fetes and fairs and had his own track. From the first days one of the prime functions of the Society was to provide information on model engineering topics. This was achieved through meetings when experienced members passed on their wisdom. On special occasions invited speakers were invited and one of the first was a regular contributor to the “Model Engineer” a Mr T E Westbury. His talks seem to have been particularly well received and he was made the first honorary member. As time went on short local visits, related to the hobby, were arranged. Although these were early days there is some evidence that members were already interested the national scene of model engineering. Three groups of interest developed – the live-steam locomotives; the marine enthusiasts; and a “00” gauge model railway group. There are passing references which hint at friction developing between the groups. The main problems seems to have been those in the “00” railway group who tried to dominate the direction of the Society. Members, especially those interested in live-steam locomotives, were dismayed by this turn of events. Strong views were finally expressed that the Boy’s School was not big enough for three factions – someone had to move. However, it may be that the temporary track arrangements in the school grounds were not satisfactory and the locomotive team were keen on a permanent arrangement. It seems unlikely that permission would have been given to build a fixed track in the school grounds. Prominent member Ron Emery talking about the 1938 period remembered that he and Arthur Pole were asked to find a new location for the Society’s HQ. After much searching someone suggested The Grange in Kenton which had a 7¼” g miniature railway in the garden. Ron Emery had moved to Pinner not long before the Society was established. His first contact with model engineering was when he met Arthur Trollope. Arthur was displaying a 3½”g Mogul 2-6.0 locomotive at the local Women’s Institute Arts and Crafts Exhibition. The two became friends and later joined the Harrow Society of Model Engineers in 1936. Ron, searching for local model railway contacts, remembered a “gentleman who ran a portable track for my junior Sunday school”. This turned out to be Arthur Pole who subsequently joined the Society in 1937. Ron recalled that in 1938, when he (as marine representative) and Arthur Pole (loco representative) were on the Committee they were given the task of finding a new HQ for the Society. The suggested move to a “more central” position was not the real reason behind the plans. The developing conflict of interests between the model railway group and the other two sections was the likely cause. There was also the need to find a location for a permanent “test track” for the steam locomotives. Ron and Arthur discovered a 7¼”g railway which was run by Mr Joseph R Jeffress, in his garden, at The Grange, in Kenton. At the time of their visit, The Grange consisted of a medium sized double fronted manor house, with two lodges and two cottages, fronting Kenton Road between Woodgrange Ave and Gooseacre lane. In a separate building, the entrance to which was through an archway under a clock tower, were the stables and workshops. Ron and Arthur were given an extensive tour of the railway, including the engine sheds, complete with six locomotives, and a magnificent workshop with two full-time resident engineers who built and maintained stock and track. After rather long and difficult discussion Mr Jeffress offered a large room over the archway entrance to the stables as a new HQ for the Society – rats and all. Entry to the new HQ was by very steep loft steps and in the winter, even with a number of electric fires, it was bitterly cold (clearly no concern about fire regulations in those days!). Members often sat around in their overcoats clutching tepid cups of tea. However, each meeting brought new faces and, as the weather improved, thoughts turned to building an elevated track in the garden. During the winter meetings the plans were drawn up for a raised multi-¬gauge track inside the existing 7¼“g garden railway. In February the Society presented Mr Jeffress with their plans for the elevated track in 2½”, 3½” and 5″ gauges. They were delighted when Mr Jeffress gave his permission. Work started in March. A drawing of the Club track superimposed on a present day map gives a good impression and shows it was an oval of about 600 feet. The construction was long wooden beams resting on cast concrete posts. Building work was completed in just five months. The accounts show that, from available funds of just over £40, a total of £38.11.8d (£38.64p) was spent on the new track. The first running week-end was a great success, held in glorious summer weather with, as the “ME” Club Notes record, “many fine engines” present – but the clouds of war were close at hand. September 1939 saw the start of the Second World War so the track was never officially opened. This had to await the end of hostilities in 1945. Later, during the war years, allotments were dug inside the area encircled by the track. There was always some aggravation from the allotment holders because everyone had to climb across the railway. Before running, the track had to be checked for clods of soil – where the rails had been used to scrape spades clean. Naturally membership dropped off as the call-up for duty in the armed forces took some of the younger ones away. The squirrel-like qualities of model engineers to store materials are well known so it is likely that bits and pieces, put aside in the past, were available during those dark days. Some activities, therefore, would have been possible but they were no doubt severely restricted. The Club track largely reverted to the sole kingdom of the allotment holders and their efforts to “Dig for Victory”. At one of the rare Society’s evening meetings a man in Auxiliary Fire Service uniform arrived, he was Bob Jeffries who with Arthur Pole, kept the Society running during the war. In later years, at the 4th Annual Dinner of the Society in 1948, Arthur Pole was asked to talk about the history of the Club and he said that during the war years the organization virtually closed down. At the end of the war, when street parties were the order of the day, Arthur Pole’s portable track was in great demand. To-day, with the wide use of the vans and cars, there are few difficulties in transporting all the necessary equipment for such an event. In 1945 things were different. For local Harrow events a Boys Scouts two wheeled push cart was borrowed. With a rather unstable load of track, loco and trolleys, etc. it was trundled by hand through the streets to the venue. All clubs have, from time to time, wonderful characters. One of the earliest and best remembered was Wally Herridge. Wally took a leading role in the construction of the Kenton track. He built a number of models and he also had his own portable track which was used for school fairs, etc. There were problems. Firstly, his only transport was a motorcycle and sidecar. Secondly, he was very short-sighted. Wally always arrived at the track with his loco and equipment balanced on the flat sidecar. It is hard to imagine how he found room for the loco; track; tools; coal and passenger trucks when going out to a school fete! Wally’s loco driving technique caused some amusement. Driving at “breakneck speed” his loco on “jelly-like” springs hugged the track. He thrashed around the circuit using amazingly small amounts of coal – and woe betide anyone who held him up. When forced to stop he simply picked up his loco and dumped it in the grass – to return to it when the track became clear. His friends and family are reminded of him when EIi (the short-sighted character) appears on BBC TV’s “Last of the Summer Wine”. Although there is a wealth of written material for the period after 1960s there is little from the early days. In gathering material for this history we are grateful to a few long-serving members who have searched their memories to provide valuable information. The existing links to the model engineering world multiplied in 1947 when the Society came onto the national scene – members appeared on television. Messrs Pole and Jeffries represented the Society with their locomotives on a television broadcast from Alexandra Palace. Although this was an important step it should be recorded here that, before he became a member, Fred Cottam appeared on TV ten years earlier. As a teenager, he made a 3½” GWR 2-6-2T which he entered for the 1937 GWR Staff Art & Handicraft Exhibition. He was awarded a rare gold medal and was asked to go on TV. He went to Alexandra Palace for a live broadcast of an “In Town To-night” type of programme with his loco. Also on the programme was the retiring Captain of the Mauritania. In October 1947 a party of members were given an extensive tour of the Camden locomotive sheds which was followed by lavish refreshments provided by member Laurie Earl – a well known driver of the Royal Train. A number of local Kodak employees became members of the Society one of whom was C R l Coles. Samples from his vast collection of photographs appear in many railway publications which feature locomotive pictures. The success of publicity in the previous year broadcast the existence of the Society. This led to a wider catchment area for membership. On the 28th April, 1948, the Club became the “Harrow and Wembley Society of Model Engineers”. The Chairman, Bob Jeffries, and an increasing number of members lived in the Wembley area and this probably influenced a change of name. Membership reached 106. The annual exhibition moved away from the regular Harrow venue to the Wesley Hall, Wembley on the 8th and 9th October, reflecting the wider coverage following the change to the Club’s name. Another important national event for the Society was their participation at the SMEE Affiliation Exhibition held at the Imperial Institute, South Kensington. The official closure of the club’s Grange track was on the 31st May, 1950. So ended an 11 year chapter in the Society’s history. Mr Jeffress had taken the Club under his wing generously providing a temporary meeting room and a site for the first track. Sterling work by members had kept everything safe during the war years so it was readily available after hostilities ended. After the celebrations of 1945 the Society took off like a rocket to become one of the major clubs in the hobby. The skilled members began to make an important mark on the national scene with their successes at exhibitions. The Society had already thought about moving to a new site and in 1949 when rumours suggested the Grange would be sold. 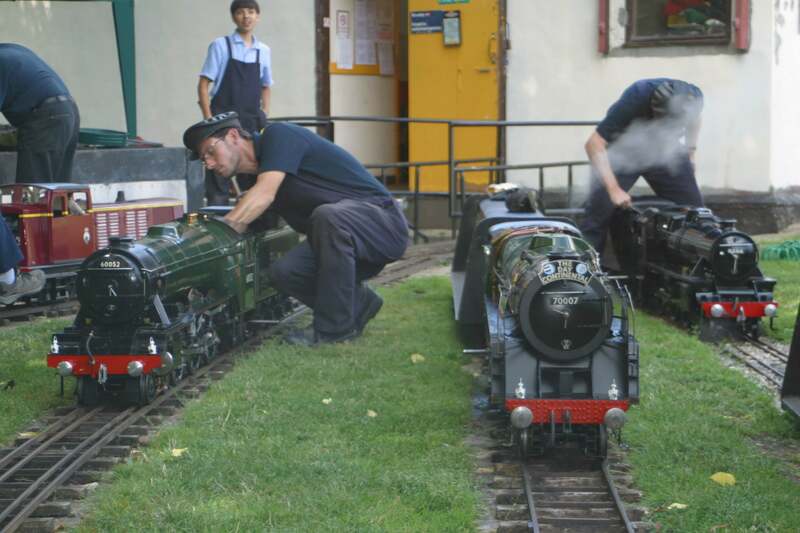 The Kenton Miniature Railway was run down and the Society realised it would have to move out. For the Jeffress family and the cost of maintaining the property had become too great. For the Society the move had become a reality in 1950. Fred Sedcole came to the rescue. He offered to open negotiations to use a corner of the British Railways Sports Association’s Headstone Lane Sports Ground. These negotiations were successfully completed and a lease was agreed. The new track was designed by John Knights (surveyor for Wm Old) who had been responsible for the building of the Wembley Stadium “Olympic Way”. On the 18th March, 1951, the first holes were dug for the brick pillars which would support the concrete beams of the raised track. A popular member Tom Clark, a local builder, worked hard on the building of the new track. However, brick laying was not a skill held by all members and the new pillars had to be vertical and soundly built. A metal jig was fabricated so that bricks could be accurately laid. The layout was kidney shaped with a high point of approximately 6 feet. Regular visits were made by working parties and a steady output of 4 large concrete track beams were completed each week. The cost of the new track was expensive, but the more wealthy members provided a subsidy. For example Fred Sedcole paid for all the new sleepers. On 26th May the completed track was officially opened by R A Riddles, Chief Motive Power Superintendent for British Railways. A photograph of the ceremony shows Mr Riddles at the highest point of the track with the first train. This high point was dreaded by some members and at least one was to fall off here. One member observed that when building a railway the designers tried to smooth out gradients with cuttings, tunnels and embankments. When you let a group of model engineers loose they will create a track with massive gradients to make their small locos struggle with their loads. The cover of the 12 December issue of the “ME” carried a picture of the Harrow & Wembley SME members preparing for their annual efficiency trials. Alan Tyler’s 0-6-0T No2 and Bob Jeffries 0-6-0 GWR tank featured. On page 807 a report gives a wonderful impression of the Arthur Pole trials. Arthur had a nasty accident when a “slam door” was opened on a train entering Harrow-on-the-Hill station. He never really recovered and the annual trials were named in his memory. Just before the annual efficiency trials Jimmy completed his dynamometer car. Construction had taken many years and was the culmination of the members’ interest in making the trials more accurate. The chassis was 52” long by 10” wide carried on two bogies. The recording mechanism occupied the centre and there was a seat at each end for the driver and an observer. A pen recorded train speed (up to 10mph) on a revolving drum. The pull of the loco was taken by a drawbar which compressed a spring from 4” to 2” which in turn drew, through a dampened rod, a second graph on the drum. The kit included three sets of drawbar for the different gauged models and included special arrangements to reduce friction on the drawbar through the curves. Right from the outset there was always some friction between the Society and the Ground Staff of the BR Sports Ground. Club members had to transport their locomotives from the car park around two sides of the ground, avoiding the hallowed cricket pitch. The smallest infringement caused great resentment. In 1966 the Society was given notice to quit the site. BR explained that a proposed road, to give access to a new pavilion by the bowling green, had to cut through the area occupied by the Club track. Negotiations were started and eventually it was agreed that the Society would construct a smaller track avoiding the line of the new road. The new track, about three quarters the size of the original, was approved. The old track was removed in a single day and work on the new commenced. The building of the new track took virtually a year so in April 1968, on a cold but bright afternoon Mr Baldwin Chairman of the BR Sports Association declared the track open. Interestingly BR never built the road round the field – and there was more trouble to come. While at Headstone Lane the Society had little opportunity to give passenger rides. Children of the British Rail players were given rides, with a box for donations on hand, but the only fare paying customers were those using the Society’s portable track at local Fetes and Carnivals during the summer months. Wally Wiseman made a generous offer by a virtual permanent loan of his 7¼”g “Midge” loco which could only be used on the portable track. (It is thought this loco is now in the Railway Museum at North Woolwich station.) It may be that this more powerful engine in a larger gauge sparked off the interest of some members to move towards a ground level track with good passenger hauling capabilities. In addition, around the ear1y seventies interest was growing, within the model engineering community, in new 7¼”g locos. The “Model Engineer” series about building a “Highlander” 7¼”g LMS 2-6-0 loco was an important spur. In 1971 some members suggested that the Society should build a ground level track to accommodate larger locomotives with the intention of providing a passenger service. Because the Headstone Lane track was on private land it would be necessary to seek an additional site where a new ground level track could be constructed. Initially there was some resistance – a lot of time and effort had been spent on re-building the track. The quiet private location and the “comfort” of operating on a raised track was seen by many as ideal. The pressure for change continued and it was finally agreed in principle that a new track would be built, if a suitable site could be found. It was intended that this project, while remaining a part of the Society’s activities should be self-sufficient through revenue from fares. After two years of correspondence with Harrow Council, a tentative offer was made for a site in Roxbourne Park, near Eastcote. It was fortunate that the Council had decided to develop a former rubbish tip as an extension to an existing recreation ground. This long strip of land borders the Yeading Brook which, in other parts of the Borough, had been developed as a stream-side walk. Roxbourne Park was a natural extension of this facility and Harrow planned extensive works. On the 26 September 1973 an Extraordinary General Meeting was called which was attended by a large proportion of the membership. The Chairman, Bob Hines, outlined the negotiations and explained the purpose of the meeting was to get the Club’s approval to continue negations with Harrow Council. The Treasurer, Tom Mallett, set out the conditions of lease at Headstone Lane and assured the meeting that the new arrangements would not replace the existing – but simply add to them. It was hoped that Harrow Council would provide some financial help since the Club had limited funds. Phil Hains explained that rides would be given at agreed times on the multi-gauge track (ground level 3½ “, 5″ and 7¼”). The long discussion which followed shows the strength of resistance that remained. A debate ranged over a number of issues; comfort of ground/raised level driving; vandalism; the fine existing site facilities; and finances. In the end the Chairman had to remind everyone that no final decision was needed. A simple mandate on whether or not the negotiating team should go ahead was required. On the vote virtually everyone approved with none against. Thus ended what, in the view of some members, was a momentous evening in the Society’s history. After a further two years of negotiations with numerous Council departments, and a mountain of correspondence, agreement was close. A final meeting was arranged between Harrow Financial Department and the Society’s negotiating team of Tony Challans (Chairman), Peter Reed (Secretary) and Peter Rainger. Towards the end of the year a tenancy agreement and financial terms were finally agreed. In September 1975, the following was reported to members: “The Council have agreed to excavate the site and to prepare the foundations for the track. To erect a garage building for use as a workshop and storage, and to lay on water and electricity services. The Council Valuation Department have suggested certain financial terms which the Committee consider to be fair and reasonable. We have, therefore, indicated our willingness to accept these terms and it now remains for the Legal Department to draw up a formal agreement.” Phil Hains agreed to lead in site meetings with staff of the Council Parks and Works Departments. His main task would be to ensure the work carried out by the Council was in line with the Club’s plans. This was very important for the laying of the track bed foundations. 1976: Track building starts – again! In March 1976 final agreement with the Harrow Council had been achieved. The lease was accepted and work was started by Harrow Council workers on the site close to the western end of Roxboume Park. A new access road was constructed from Field End Road leading to a car park. The track foundations were excavated and laid with “hoggin” (a clay/gravel mixture which is traditionally used for path foundations). The workmen, more familiar with laying paths, included a number of sharp comers. Phil Hains had to persuade them to return and realign the foundations with gradual curves suitable for a railway. The “back straight” still retains a dog-leg kink which was not in the original design. The Club had purchased quantities of fine ballast which was laid loose on the “hoggin” foundations. The track, constructed of aluminium rail fixed, with screws, to sleepers was laid in the ballast. At a later date the sections of track were secured with long spikes driven down into the foundations. On the 6th June 40 feet of new track was laid with the permanent way team, with a toast of orange squash, wishing good running to all those who would pass this way! The aim was to have 300-400 feet down in the season so running could begin. Hard work by all concerned resulted in 600 feet in place by late September. The concentrated efforts on the new track did not stop the running a Headstone lane where many of those working at Roxboume were seen running their locos throughout the fine summer Sunday afternoons. The Friday track building volunteers were set the task of completing the final 125 feet of track to complete the circuit on Sunday 17 October. The first running took place during the afternoon – a week before schedule. The capacity of “Midge” to pull passengers at ground level no doubt encouraged members who had suggested that bigger locomotives would be ideal at Roxbourne Park. The construction of larger passenger carrying carriages was in hand and a group of members were engaged in building six 7¼”g Class 5 “Highlanders”. The year was to be a busy one, especially those “active” members. The Model Shop in Harrow moved to new premises near Bonnersfield lane. The Club was asked if it could take part in a model engineering exhibition on the 3rd to 17th April. Eleven models were loaned and displayed in the window, it was a great success. A friendly relationship has continued to the present day and members can still get a discount by showing their club badge. Just seventeen days after the opening of the Roxbourne Park Railway an Extra­ Ordinary Special Meeting was called. The Chairman explained the current negotiations with BR Sports Association for the renewal of the 10 year lease at Headstone Lane. The Association insisted on an increase in rent from £50 to £300 + £15 affiliation fee) with no security of tenure and rent increases at any time. Members were very aware of the time and effort that had been expended on building the second raised track so many were reluctant to give it up. A one-year trial was narrowly defeated and the Society decided to leave Headstone Lane at the end of the current lease. A year later the final track run was held on 8th June 1977. The pressure of running passenger services was beginning to bear on the Society. The development of the track created more hard work for the working parties during the winter months. A request went out to members to volunteer for Station Master; Track Steward; Signalmen; Guards; and Ticket sellers to help organise the running of the railway on public days. It was hoped that members would bring their families along to join in the activities. A set of basic rules was provided to ensure safe and efficient running. Brian Heard planned to install the first two electric signals during the summer. Also planned was a ramp for off-loading locos from cars onto the steaming pit via a new siding and point. The raised steaming bays were joined to the track, via a traverser, down a new ramp to another point near the level crossing. In early January, following contacts made at the “Model Engineering” Exhibition, the track was opened for visitors from Switzerland, France and Germany. The Chairman, Tony.Challans, completed a 7½”g narrow gauge Romulus 0-4-0 loco in six months which was seen at the track on test. After some minor teething difficulties, which were quickly fixed, Tony had his first drive. He only managed three circuits of the track before a number of members stepped up to try their hands at narrow gauge driving. The final social meeting of the year was held on 13th October with the Night Run and Barbecue. Problems with hand signals to the signalman in the dark were resolved by the use of locomotive’s whistle. One for right and two to go left into the station! During the afternoon Peter Steadman found that vandals had damaged the track. After a few phone calls a number of regular helpers were assembled and the track repaired before the evening activities. The ease with which vandals were able to lift sections of the aluminium track, laid in ballast, was one of the reasons which later caused members to think about design changes to the track. The increased activities at Roxbourne Park with the regular passenger services appear to have created an upsurge in model building. The pages of the Club magazine “Con-Rod” had numerous references to new projects for building locomotives. There was an increased interest in Narrow Gauge models. The testing of boilers had, by this time, become compulsory and a total of seven members were listed as official club testers. A duplicate set of testing equipment was made available at the track. Space in the Club Hut had become a premium and Harrow Council gave approval for the erection of a second sectional building. Construction of the signal box, extending from the side of the hut, was well in hand at the start of the year. Work was started on building more passenger cars and volunteers were requested for making signal brackets and point levers. An ex-display sectional garage was purchased, dismantled, transported to be rebuilt next to the existing hut. By June the new coach shed had been completed with four roads for storage connected to the track by a series of points. A communicating door to the original hut was knocked through. The signal box finished with a gantry of manually operated semaphore signals. On 6th September the Southern Federation held its Autumn Rally at Roxbourne Park. There was a small ceremony when the Society’s Club flag (the Club badge on a pale blue silk background) was raised on a new flagpole. The event was a great success with 29 visiting locomotives from clubs throughout the southern counties. In the late afternoon the gathering was treated to a flying display by the RAF Memorial flight of Lancaster Bomber, Spitfire and Hurricane which, by chance, was visiting the nearby Northolt airfield. The event required great efforts by members but, although exhausted at the end of the day, many hoped the Southern Federation would re-visit in the future. The activities of the Society had outgrown the hut accommodation again. Storage of passenger cars was difficult and any official meetings had to be held in hired church halls. Plans were prepared for a purpose built building and the London Borough of Hillingdon eventually passed them – after insisting modifications to provide massive foundations. Tony Baker and Basil Weait had taken on the task of negotiating the plans through the Council and they now turned to organising the construction. One main consideration was to maintain security of the Club’s equipment while the work was in progress. After much thought a scheme was developed to build around and over the existing hut complex. One end and part of the back were completed during the winter 89/90. Members maintained the general operations of the railway but the main attention was concentrated on the building work. Throughout the year working parties were seen attacking this major project. One of the existing sectional buildings was dismantled and rebuilt outside the site of the new building. This allowed the construction of the new foundations to go ahead. During 1991, every effort was made to keep control of the normal routine tasks of maintaining the track and passenger service. As in the previous year construction of the new hut was the main interest and by April the foundations, skeleton steel work and 50% of walls were complete. The physical size was impressive and a credit to those who had toiled so far. There was still a lot of work to do. During the winter months there was a blitz on the building work. The Signal Box, which extended over the building line of the new hut, was demolished. When the new walls were complete the remaining sectional building was demolished. Then in the same weekend the roof was added to the new Club building. In the following weeks internal walls were erected and areas designated for the workshop, carriage storage, two toilets, signal box, kitchen and general meeting space. Now that the new accommodation was weatherproof work was concentrated on fitting out the interior. Plans were made to use it instead of the local church hall for the 1992/3 winter meetings which started in October. >At the end of the year the Society was approached with a request to take the portable track to the studios of London Weekend TV for their Staff Children’s Christmas Party. Alan Storer’s 7¼”g 0-4-0 Romulus provided the motive power and trains carried children through a tunnel into Santa’s Magic Grotto. Many celebrities and their children joined the long queues to ride on the train. Negotiations had been going on to feature the Roxbourne track on television. Alan Storer led the Society’s team of members who agreed to take part. On a very cold wet day, in February, the BBC cameras came to the track to record sequences for the children’s TV programme “Playdays”. Children from the nearby Field End Road Primary School, with their teachers and interested parents, arrived in the drizzle to be greeted by one of the programmes presenters. Alan Storer’s 7¼”g Romulus 0-4-0 loco was to perform the major part in the filming but Norman Burgess’ 7¼”g 0-4-0 “Invicta”, Graham Clack’s 7¼”g Black Five and Eric Basire’s 5″g Metropolitan Electric Loco N° 8 “Sherlock Holmes” also played a part. The programme also started a regular link between the school and the Society which led to special rides for whole classes as an end of year (June or July) treat. The programme was a great success and has been repeated many times by the BBC. After every re-showing the Leisure Department of Harrow Council offices are regularly contacted with inquiries about the Harrow and Wembley. Recent editions of the London A-Z street map included the location of the track. The Youth Group, of five members, were asked if they would be interested in undertaking a special project. The Committee agreed to provide a task which the Youth Members would manage on their own. The existing electric signals around the track were operated from the signal box. A former manual signal gantry, close to the signal box, had been removed when the new hut was built. It was suggested this feature should be replaced and rebuilt in another location. The Group were given a series of tasks. Firstly, to design the new gantry which would span three tracks (exit from carriage shed; exit from club siding; and main line). Secondly, to design a semaphore signal which would operate on the existing electric two wire signalling system. After these designs were agreed the Committee wanted a costing for the whole project. Next, if accepted, the construction of the gantry and a prototype signal arm would begin. Finally, three semaphore arms would be made for the gantry. It was essential that all the work on the project was undertaken by the Youth Group alone. When they required advice, or teaching of specific skills, it would be given by senior Members – who were not allowed to do construction work. Welding played a major part in the fabrication of the gantry and Jack Vizard provided the necessary tuition. His involvement later developed into taking on the lead of the Youth Group. At the Midlands Model Engineering Show the Youth Group won a Commended award for their project which was represented by the working semaphore arm. The gantry was successfully completed for the start of the season. At 6ft 6ins high it made a fine new feature on the track. The working prototype semaphore signal arm performed well, and visitors gave their seal of approval. Work was started on four more signal arms but school examinations and entry to university and/or college have slowed this work down. In fact the Youth Group are now all full members. In May 1994 the Society arranged the first Steam Vehicle Day. Jim Davidson took control of the organisation, aided by Malcolm Saytch, and it was a great success. Visitors took great delight in the open spaces in which they could run their vehicles. The splendid meal, provided for all, was well received and there were many requests for a repeat the following year. Refurbishment of the Club’s rolling stock was started. The years of wear on wheel profiles, roller bearings and brake mechanisms were corrected. The ends of each carriage replaced and new padded and softer seat was added. As each car emerged the public were treated to a smart new black and maroon livery complete with a large yellow club logo on each side. The Society started off the celebrations for its 60th anniversary with a bang by winning the “Best Club Stand” in the 1996 Model Engineer Exhibition. The stand displayed a range of locomotives and boats representing model building from 1940’s to the present day. It was appropriate that Arthur Pole’s 5″g “Cornwall” was included in the historic loco display. A display board of club photographs provided a pictorial history of the Society. Traction engines were represented by Mike Pavey’s Fowler and junior modelling by his son’s model aircraft. A range of smaller gauge locomotives and a working semaphore signal provided additional interest. The main display was a “street repair” diorama with John Cousins’ road roller complete with workman’s hut, brazier, oil lamps and pole barriers. The Harrow and Wembley Society of Model Engineers maintains a major position in the National Model Engineering scene. The Club regularly takes part in National Exhibitions and many of the 100+ members are still actively involved in making new models. The members are keen to find new recruits and young blood is essential to the future of the organisation. Anyone interested should see details elsewhere on this website. Running passenger services every summer Sunday afternoon (weather permitting) from 2.30 – 5.00pm creates its own problems. Not the least is maintaining the Club Loco and passenger cars, the track, and general infrastructure. Annually the Society holds two special events when fare receipts are donated to charity. The special Open Weekends (see elsewhere) are popular and many friends for all over the country attend. These special weekends cater for members interested in marine models when a temporary pond is built for them and our visitors. A group of members determined to mark the new millennium completed an extension to the track. The original plans for the site were never fully completed and it was decided to press ahead with providing an extra 800ft of track. This work not only increases the interest for passengers but it also improves the safety aspects for running trains. The extension includes a long section where trains pass in opposite directions and on busy passenger running days the signal staff do not have to constantly change the facing points leading to the terminus. The Youth Group’s Signal Gantry created an interest in semaphore signals and a new one was added for the exit from the extension track. The Society continues to provide a public amenity in Roxbourne Park, Eastcote by running passenger services every Sunday afternoon throughout the summer months. On Wednesday afternoons senior members gather for non-public running to reminisce and try out their new, or recently repaired, models. This group also find time to provide “Educational” visits for local schoolchildren. Usually this involves a short talk on the history of railways followed by free rides on the trains. One of the other main social activities of the Society is the Winter Programme of events. The meetings take place on the second and fourth Wednesday evenings of every month from October to April. Held in the Club hut these usually start at 8pm. These consist of talks or film shows by outside or club speakers. There are also Club events including competitions, and displays of members’ current work. Normally the programme is published in the “Model Engineer” magazine – Club News section and of course on this website. Non-members interested in a particular event are welcome (members only at the AGM). Anyone interested in joining us will be most welcome – contact Secretary.